One of the smaller ray species. Wingspan of up to 2 feet (60 cm). Overall length can reach 3.6 feet (1 m), weight about 11 lbs ((5 kg). They live approximately 9 years. Found in the western Atlantic Ocean from Chesapeake Bay to the Gulf of Mexico. Inhabits coastal waters, including estuaries, lagoons and sometimes rivers. Feeds on benthic invertebrates, polychaete worms, small crustaceans, shrimp, crabs, mollusks, small fishes. Aplacental viviparity (fertilized stingray eggs remain in the mother’s uterus, ingesting their yolk sacs. Once the embryos have fully consumed their yolk sacs, the embryos are nourished by ‘uterine milk’, secreted by the mother. Gestation is 4 to 4.5 months. One to four pups per litter. Non-aggressive species of little danger to humans with the exception of their defensive venomous barb located near the base of the tail. Avoid handling or exercise extreme caution. 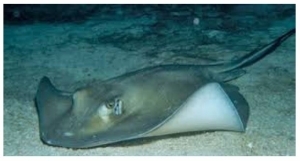 Do the “Stingray shuffle”, drag your feet while walking in shallow sandy bottom waters.